Hey there Paper Peeps. 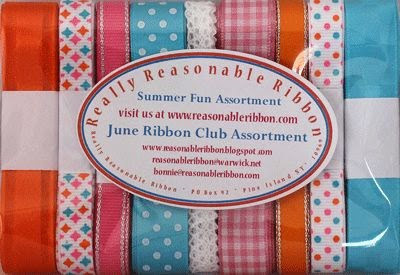 I'm dropping in to share a card I created with the new June Ribbon Club Assortment. When I got a look at the Summer Fun Assortment I was like WOWZA, I love these bright colors!!! Now what will be bold and wild enough to go with them??? Bohemian Bazaar from Graphic 45. Is this card bright enough for ya??? I really love it...and it cheered me up on a gloomy day for sure! I usually like to top my bows off with buttons and tags....but I couldn't help myself but to continue layering up this card with fussy cut flowers and dimensional Orange Open Roses and Cosmos from WOC. My BOLB Kathy Clement sent me a fabulous little gifty of an envelope stuffed full of great diecuts from her stash and this one was really perfect for this card...but needed a little extra flair so I Stickled the heck out of it. It took forever to dry..but the effect was well worth it! I layered some of the ribbons on it. Notice how I used the solid black cardstock as a border so your eyeballs wont bug out of your head when you look at all these patterns?